The organisational structure of Wayeb is comprised of the mandatory statutory organs of the association defined by the Statutes as well as “activity-related” committees which are formed and kept up by way of Internal Regulations. Wayeb is composed of affiliated, honorary and sponsoring individual members. Affiliated members are the six Founding Members of the Association. Statutory Members are those who participate in the statutory activities of Wayeb. Members and Sponsoring Members support and benefit from the services. All members of the association form the General Assembly. The General Assembly meets annually to report on, discuss and approve activities and decisions as well as budget and administrational changes. Founding Members and Statutory Members form the Council of Statutory Members, they are the only members who have a full vote in the General Assembly. Administrative, financial and scientific orientations of Wayeb are defined by the Administrative Council. The Administrative Council is composed of the six founding members, a maximum of six elected members, as well as other active members and national coordinators upon invitation. Members of the Administrative Council are elected by the General Assembly. Only citizens of one of the countries of the Council of Europe may become members of the Administrative Council. The Wayeb Board is the authorized, executive organ of the association, and it administers and coordinates all matters of Wayeb. The Board is elected for one year by the Administrative Council. The Board is composed of the President, the Vice-President, the Secretary and the Treasurer. All of these posts are voluntary and honorary. 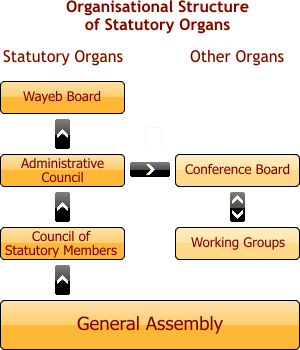 The Board, Administrative Council, Council of Active Members and General Assembly are the statutory organs defined by the Wayeb bylaws. Further committees and so-called ‘Working Groups’ implement Wayeb’s activities and goals. The Conference Board handles all matters and decisions regarding the organisation and coordination of the annual European Maya Conference. The Workshop Working Group organises Workshops on Maya Hieroglyphic Writing within Europe. It is closely associated with the Conference Board and takes care of the organisation of the annual workshop which accompanies the EMC.